Mackenzie is confident in the process of spinning off part of BHP's business, which will leave the miner with a higher quality core of 19 assets. 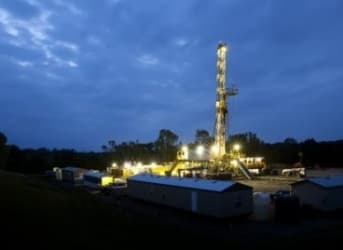 Mining giant BHP Billiton (ASX, NYSE:BHP) (LON:BLT) said Monday it may soon sell its Fayetteville shale gas assets in the United States, which it bought during its US$20 billion buying spree three years ago. In a presentation published in the company’s website, BHP confirmed it had started "marketing" its Arkansas-based assets to potential suitors. "As we look to improve the balance of liquids and gas across our petroleum portfolio, we have initiated the marketing [of] our Fayetteville acreage. However, we will only divest the field if it maximizes value for shareholders," the world’s biggest miner said. Unveiling further details about how it expects to meet cost-reduction and productivity improvement targets, chief executive Andrew Mackenzie added he’ll limit BHP’s annual capital expenditure to $14 billion after completion of a planned demerger next year. The Anglo-Australian miner is in the process of spinning off part of its business, leaving it with a higher quality core of 19 assets. This core portfolio is expected to grow output by 23% in copper equivalent terms over the next two years to the end of the financial year ending June 30, 2015. The figure compares with the company's previous guidance that it would grow output by 16% over the same period, including output from the assets that will now be spun-off. "As our capital efficiency improves we will be able to create more value for less investment. We believe we can significantly reduce annual capital expenditure relative to our current plans while maintaining our growth trajectory," said Mackenzie. BHP expects a minimum $3.5 billion in annualized productivity gains by the end of the 2017 financial year with more than $2.3 billion to come from cash cost savings, mostly at its operations in Australia and Chile. At its Western Australian iron ore mines BHP plans to deliver a further 25% reduction in unit costs in the medium term, while in its Queensland coal unit — where 700 jobs were cut last month — it expects to cut down costs by 10% to below $90/ton in the 2015 financial year. Copper assets will also face pressure, with cost reductions at BHP’s majority-owned Escondida copper mine in Chile expected to shrink by 5% in the 2015 financial year.